The focus for Part 2 of the series (Spring and C24 iO - Accelerating Enterprise Data Services Deployment) concentrates on integration namespace capabilities that have been provided by C24 for building integration flows and, through example, explores the use of C24 iO within those flows. Some contextual information may be required in order to better understand the example code and configuration. SWIFT is a messaging standard used by most of the world's financial institutions. If you've not come across them before, SWIFT messages look like someone has danced on a keyboard so don't worry about understanding the content. The important aspect is that it's a message type that is standard, well adopted and complex enough that it's difficult to write custom code in order to parse. SWIFT messages (ISO-15022) are usually specified by type using a number, so, in this example you will encounter an MT540 SWIFT message, this is a Receive Free message sent from an account owner to an account servicer. If you don't know SWIFT but you either use C24 iO or perhaps are thinking about it, read on, it's not a major obstacle. C24 Spring Core provides capability to use iO model objects as Spring beans using very simple XML namespace or @Configuration annotated classes to populate the Spring container. The Spring Integration framework provides capability for Spring Integration Messages (org.springframework.integration.Message) to be handled in a uniform way by integration constructs such as gateways, splitters, aggregators, header enrichers, filters and transformers; that list is not exhaustive. These integration constructs have no knowledge of message payloads, their types or their content. Although the Spring Integration framework offers a set of constructs that support lightweight messaging, it does not natively support specialist data-binding, transformation and validation as this would require a more intimate knowledge of the message payload as well as tooling around message models, validations and transformations. Spring Integration provides the facility to plugin code that can perform those functions, i.e. via Service Activators, but this means that configuration and distribution of that code is much more difficult, i.e. it would always result in developers having to write and share custom Service Activator (Java) code. This is a requirement that we are really trying to avoid as there is a much more attractive solution available. SpringSource has partnered with C24 to provide native capability around 12 three core aspects of message processing: 1) specialist binding, 2) validation and 3) transformation. Extending the semantically rich offerings of Spring Integration constructs by adding C24 iO capability required doing two things. Firstly, a namespace was constructed that specified syntactic requirements for those three types of message processing construct. Secondly, a set of Spring Integration beans have been built that are able to process iO model objects as Spring Integration message payloads. This work was undertaken by SpringSource engineers early in 2011. The partnership between C24 and SpringSource has resulted in native capability within Spring Integration to process iO model objects in ways described in the following sections. 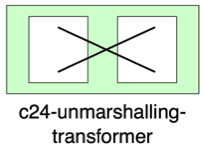 The C24 Spring Integration Unmarshalling Transformer construct provides capability for the Spring Integration Framework to receive a message in any supported data format and output it as a C24 iO model object. By way of example, the Spring Framework may supply a raw SWIFT MT541 message String (as shown in Diagram 3) to the transformer below. The result is that an MT541 model object will be returned. Note that no custom Java code had to be written in order for this to happen, merely simple namespace configuration. The source-factory-ref is the name of the parser that will bind the input to this transformer into an object described by the bean reference model-ref. The C24 Spring Integration Marshalling Transformer construct provides capability for the Spring Integration Framework to pass in a C24 iO model object and output it in an alternative, and configurable, format. In the example below, a message containing an iO model object can be passed-in, a JSON (java.lang.String) representation of the object is returned. Some of the sink-factory attributes that are currently supported are for: XML, JSON, CSV and Java Source. The C24 Spring Integration Transformer construct provides capability for the Spring Integration Framework to pass in a C24 iO model object and receive output as another C24 iO model object. In most cases the source and target iO model object are different types, but that’s certainly not a prerequisite for transformation. The single most significant parameter is the one that identifies the target or output iO model object type. 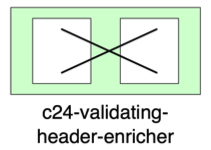 The C24 Spring Integration Validating Header Enricher is a type of transformer that provides capability for the Spring Integration Framework to pass in a C24 iO model object and receive output in the form of validation results. Results are loaded as [K,V] pairs into the Spring Integration header, this means that they can be accessed by other integration constructs or even SpEL expressions directly. The result of using the construct in this way will mean that all fail events get loaded into an SI message header named “c24_failEvents”, all pass events into a header named “c24_passEvents”, and statistics for those operations into a header named “c24_statistics”. Default values for that namespace are true for fail events, false for pass events and statistics. 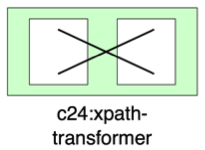 The C24 iO XPath Transformer is a type of transformer that provides capability for the Spring Integration Framework to pass in a C24 iO model object and receive output data of various types including object, string, boolean and list. The data that’s obtained from using this integration construct is derived directly from the iO model object payload. 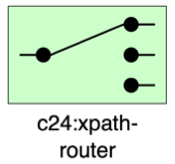 The C24 Xpath Router is a type of message router that provides capability for the Spring Integration Framework to pass in a C24 iO model and have messages routed to a specified channel determined by an XPath expression. This router is much the same as the pure Spring Integration router except that support is added that enables iO model objects to be routed to channels, determined by XPath expression results invoked against that data. As with a standard router configuration, you can also specify a default-output-channel that’s used if a single message channel cannot be chosen from the set provided. It is also possible to configure a bean reference that can be used to provide the XPath statement. 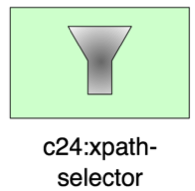 The C24 XPath Selector is a type of Filter that provides capability for the Spring Integration Framework to pass in a C24 iO model object and determine if the message will continue to undergo processing. That decision is based on the result of a comparison between payload content data and data provided in the namespace construct. If the message is not filtered it will be returned as the payload to the Spring Integration Framework, otherwise it is discarded. In this example, only SWIFT messages that have a cancellation function will continue to undergo processing, all others will be discarded. Once again, the XPath statement can also be supplied as a reference to a Spring bean. Given a @Configuration class such as the following, two beans will become available from within the Spring container. Firstly, the textualSourceFactory is the factory object that will provide the instance of the SWIFT parser to any namespace construct that requires it. Secondly, an MT541 model object will also be made available to any namespace construct that requires it, i.e. any namespace construct that performs marshalling/unmarshalling or transformation involving MT541 models. Of course, you don't have to use a @Configuration class to populate the Spring container, you can use an XML descriptor to declare the beans instead. The sample project reads a raw SWIFT message and then progresses it through a series of pipes and filters. The single namespace construct that binds a raw SWIFT MT541 into Java code is the following. into a C24 Java object. Once that's done, as a developer you can change SWIFT message values, perform semantic validation or anything else that you choose to do with the Java object. The sample project contains a number of C24 models and transformations, we've looked at the MT541 model but what about transformations? 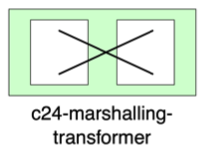 In order to transform data from one form or type to another we can use a C24 iO transformer. These transformers take data contained in a source model object and transfer them into a target model object. These two models can be the same type but more often than not, the transformation takes place between two distinct models. The transformation class, automatically generated by C24 iO during deployment of the transformation model, will receive the MT541Message that's passed into it and output a single XML string. This XML string automatically becomes the Spring Integration message payload and will be delivered to the next namespace construct in the flow by the Spring Integration payload. This is just a very small and specific taster of C24 Spring samples, further examples will be published in future articles.